As much as this project is an intellectual exercise, and a frame for my own thinking about strategy, it is also an art project, and working on it has made me realize both how little art I have been making lately and how much I have missed it. I have been having a lot of fun playing around with different media, and looking for solutions that will allow me to create a specific look with the limited equipment and materials at my fingertips. While I have already decided on the style for the main illustrations for the book, I have still been experimenting with other materials just for fun. I got a picture in my head of a chapter title page. (I don’t know if I am even going to use chapter title pages in this book, but I see no reason not to mock some up anyway). The final image I want to get will be a print, specifically a monotype, very simple, graphical, and vertical, and I already have Ant working on the lettering for it. 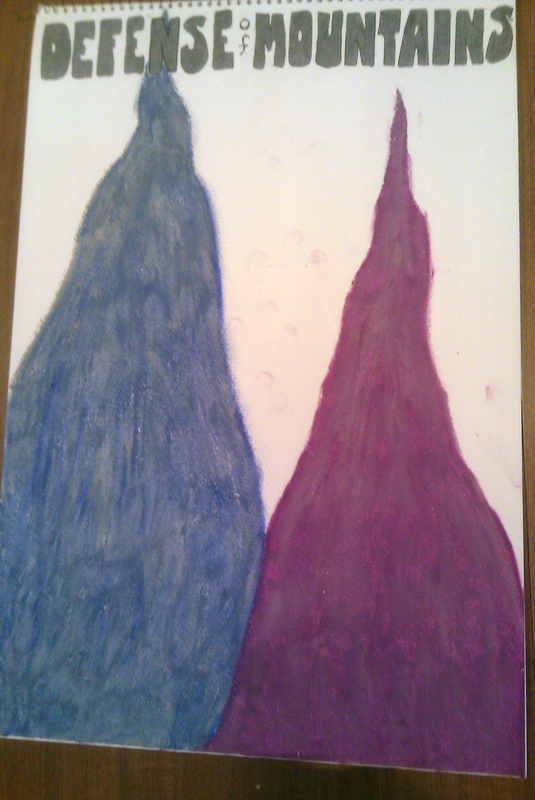 In the meantime, I wanted to get a sort of draft version of it done, which I decided to make using oil pastels. I used to use these a lot, and always enjoyed the very messy, process-oriented, hands on nature of the medium. (I’m a printmaker; in case this wasn’t clear already from my explanations of printmaking, the Ragnarok comic book project, and oh, this entire blog, I am all about process). I haven’t used them in ages, and I had so much fun digging in and hand-blending them, that once I finished the draft for the chapter title page, I made a scratchboard hedgehog, just for fun. The scratchboard effect is something you might remember from second grade. You can do it with regular crayons, if you are willing to put in the effort to really bear down with the black crayon over the top, but it is easier to execute with the much softer oil pastels. Basically, you lay down a pattern of colors, then cover it completely with a darker color, usually black. Then, you take a stylus (or a pencil, or a paperclip – anything with a sharp tip) and draw with that, removing the black where you mark and revealing the color beneath. 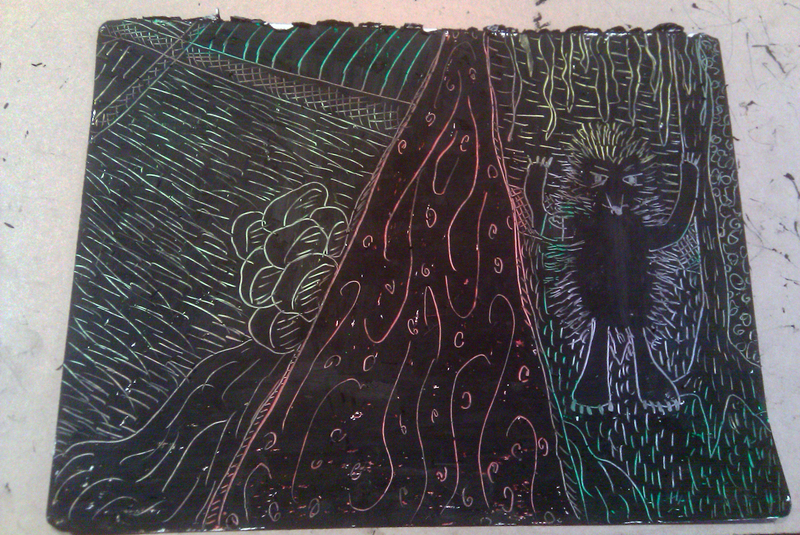 So here is our hedgehog, triumphant, scratchboard-style. I wouldn’t say that I am avoiding dealing with the text here, but it is a lot of work, and I am awfully busy lately, so I will fess up to sometimes choosing the quicker job of playing with imagery instead of working my way through more text. It’s more instant gratification. However, I am working on it. I am going through the book front-to-back. I may not keep every chapter, section, etc, but I am trying to be methodical about how I approach it, and keeping it all in outline in that way. Once I have my summaries of everything together, I will decide whether it makes sense for this project to keep everything in the same order, etc. I will definitely post some of my summaries before I get to that stage, as this is where I will really be looking for input: Can you make a case that something I have left out is essential? Or that something I have left in is not? Do you think I am totally misinterpreting something? If so, I will want to hear about it.